Plus, more on the Sony Pictures hack, Afghan security, and intelligence failures. Mid-week links. 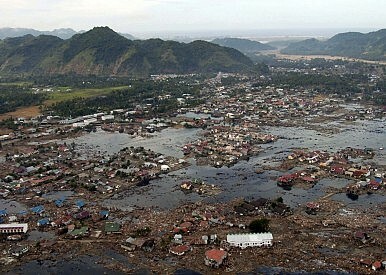 The Indian Ocean tsunami was one of most serious natural disasters to affect the Asia-Pacific region, resulting in 250,000 deaths across 14 countries. It also took place precisely 10 years ago on Friday. The tragic consequences of the tsunami led nations in South and Southeast Asia to bolster their disaster relief capabilities and resulted in improved maritime security practices across the region. To commemorate the tenth anniversary of the tsunami, the Telegraph has prepared an absolutely stellar interactive multimedia walk-through of the day, cataloging the immediate consequences of the natural disaster on a minute-by-minute scale. Do take the time to browse the carefully curated selection of images and accompanying data. As Diplomat readers will be aware, the fallout from the Sony Pictures’ hack, allegedly carried out with either the direct sponsorship or involvement of the North Korea government, is complicated and ambiguous. I’ve covered the subject from a few angles, primarily concerning the U.S. government’s response to the hack. Here are a few other pieces worth reading from around the web: at Vox, Timothy B. Lee has a helpful wrap up of the evidence for and against the U.S. government’s assertion that the North Korean government had a hand in the hack. Over at Politico, Joseph Marks takes a look at the notion of a “cyber counterattack” — an indeterminate concept in many senses. The National Interest has an interesting feature piece taking a look at the Sony hack in the broader context of last year’s Edward Snowden leaks and the evolving relationship between the state and the Internet at large. Also again at Vox, Max Fisher has a useful rundown of “Lizard Square” — a hacker collective that could have abetted North Korea in hacking Sony. Afghanistan’s security outlook heading into 2015 will inspire pessimism as reports suggest that the Taliban have successfully made major inroads into several districts that were previously won over by U.S. and international forces over the last four years. The Taliban, beginning with its “Spring Offensive” in mid-2014, has set out to destabilize Afghanistan’s new national unity government. Finally, the second issue of The Diplomat‘s new subscription-based app is available via an app on Apple iTunes, Google Play and Amazon. Excerpts are available here and include a 2015 Asia-Pacific prospectus with contributions from our cast of regular contributors, a look at Narendra Modi’s plans for India in 2015, and a prospectus for Shinzo Abe’s coming year in Japan.